On May 16, at 09:52 an emergency call was received to "911" service that a rockfall had occurred from the cliff near the 2nd house in Syunik village, Syunik Province. As a result of which the roadway became closed. The rescuers’ help was needed. 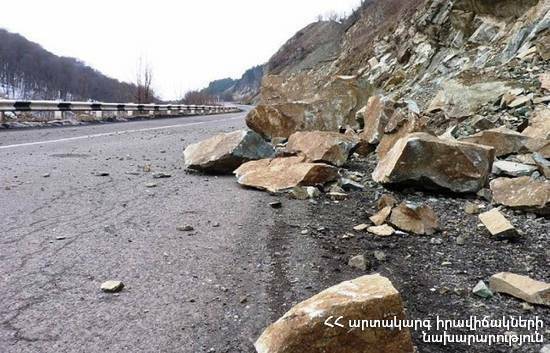 It turned out that the rockfall (about 3 m3) had occurred near the 2nd house of Musabek district in Syunik village. The community service workers took cleaning up actions of the roadway: the roadway became passable. The received information was transmitted to the Municipality of Syunik Province.